ANOTHER confession: I have always been a bit of a late developer. How else can I explain why I never went to the Edinburgh Festivals over the years until this weekend – and that was more by accident than design. That’s what I thought as I tramped the old cobbled streets in Edinburgh on Saturday. It’s an extraordinary event – the street shows alone are mind-blowing! I was taken aback by the thundering Korean drummers who somehow beat amazing rhythmic sounds from their drums. If they haven’t yet performed at the Roundhouse it won’t be long before they do. And here they were giving a free show in the historic Royal Mile! I squeezed in four shows over two days and still managed to see a bit of the great city which was once Britain’s literary capital in the 18th century. The first show, a talented interpretation of the Just So Kipling musical by a sixth-form performance group from Tring, acted as a tasty starter. Its producer Simon Sharp, who also played the piano, has performed on occasions at the King’s Head in Islington. Its star was 18-year-old Craig Fletcher who has just won a place at RADA in Bloomsbury – imagine there were only 30 successful candidates out of 2,000! Second, came a one-man version of Bethshevis Singer’s story, Gimpel the Fool, full of profound philosophy about the meaning of real love between human beings – and we can never get enough of that! 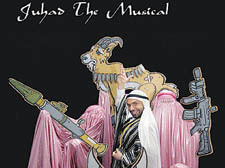 But the show that grabbed me was Jihad The Musical! Lynn Barber of the Observer wrote on Sunday that she had walked out of this New York show after 20 minutes. One or two critics panned it. Perversely, I left the packed venue humming one or two of its songs, I wanna be like Osama and Jalalabad. Perhaps some people may find it too near the knuckle, but if the theatre doesn’t make you think hard, it’s probably failing somewhere. Its performers were mostly top- class, especially Sorab Wadia as the dancing, twirling leader of the terrorist cell and Emily McNamara whose parody of a typical Fox News presenter touches a nerve! Nicholas Kent, who runs the Tricycle Theatre in Kilburn, could do worse than pencil this in for a coming production. An earnest, moving one-man show of the life of that great singer Paul Robeson – by the way, he performed for the political fringe theatre, Unity, in King’s Cross in the late 1930s – finished my festival late Sunday evening. It was relentlessly political, highlighting his devotion to the civil rights movement years before Martin Luther King and Malcolm X came onto the scene. Though he was hounded by the US government, black-listed by theatre producers and concert impresarios and often suicidal, Robeson wouldn’t give up his principles right up until the end. There’s a film here – but who will make it? Tayo Aluko, a Nigerian Scouser, with a good baritone voice, pulls off a little gem. After the show, I asked him why he had chosen to make it so political? “You bet I wanted to make it political”, he replied. IT’S often the go-getters who migrate to make something of their lives. When an 81-year-old man told me his life story as we walked from the funeral service on Thursday of a fellow Trinidadian, Frank David, I sensed what drove West Indians to come here in their thousands in the 1950s. They were all go-getters, it seems. Frank, who died recently at 77, was such a man. Like so many West Indians who came here there were only two types of jobs on offer, bus conductor or ticket collector at a Tube station – however high their academic qualifications. After a short period, Frank, well educated, and a driven man, set up a kind of shipping agency business at his Crouch End home, and soon became known as ‘Mr Fixit’ among compatriots, many of whom wanted to send goods back to their homes. But it was his passion for cricket that made him a household name especially among the Trinidad diaspora in London. Virtually single-handedly he plucked a cricket team from among the talented youngsters, many, but not all, West Indians – and soon Frank’s Cavaliers were swashbuckling their way through the London cricket grounds. Cricket lovers in Camden, Islington and Hornsey knew them well. In the 1980s and 1990s he took his team on tour in the West Indies, partly to hone their skills, also to show off his boys. Among his boys were youngsters such as Paul Weekes, Mark Ramprakash and Carl Greenidge, who later made their names as pros. Recently, the cricketing chiefs in the West Indies, responsible for Commonwealth Games, honoured Frank for his contribution to cricket. I met him two or three times in recent years at the North Middlesex cricket ground in Crouch End when he organised an annual tournament in memory of another great amateur cricket character Roy Seon. An airline executive, Glen Cunim, spoke about him as a man of vision in a tribute at the funeral service at St Peter the Chains in Crouch End. He recalled the 1950s’ magnificent novel, The Lonely Londoners by the Trinidad writer Sam Selvon, as he described Frank’s early years in the capital. Calypsos and ‘soft music’ from composers like Ivor Novello formed Frank’s other love, enough for Mr Cunim to end with “His song has ended but the melody lingers on.” This brought full-throated cheers from one or two in the packed church. Pavilion, but I gather Frank’s life was celebrated with music, laughter and songs. WHO is this cherubic little cowboy claiming to be quick on the draw? Believe it or not, the kid in the stetson is no other than Keith Moffitt, leader of Camden Council, and this snap heads up his personal profile on Facebook, the popular internet social networking site. Keith, of course, won’t be checking Facebook – an internet craze that boasts millions of users around the world – from his desk in the Town Hall. It has been judged too much of a distraction and banned from staff computers. Other hip Facebookin’ Lib Dem councillors include Flick Rea, Ralph Scott and Fred Carver – the latter appears dressed up like a giant football mascot. On the Labour side, a quick scan tells you that Theo Blackwell leads the way with at least 200 Facebook friends. MORE change at the top in the Town Hall. Assistant chief executive Philip Colligan is apparently due to move to a housing brief, while new legal chief Andrew Maughan has been drafted in to take over as the borough’s most senior solicitor. The latter post was once held by Alison Lowton, the lawyer who retired last year during a cost-cutting drive. But whispers reach me of even more itchy feet. My sources tell me that a well-known face in one of the most senior roles at the Town Hall is now looking towards the exit and was in an interview last week for a chief executive job in east London. ALWAYS a free-thinker, Air Marshal Lord Garden became a thorn in the side of the Establishment after he left the service. He would often talk freely to my colleagues on the Gulf War and later the invasion of Iraq. Just three months before his recent death, Lord Garden, who lived in West Hampstead, spoke eloquently in the Lords demanding Parliament have the right to vote on whether Britain sends troops to war. To him it was self-evident the use of lethal force must have “democratic legitimacy and accountability”. He reasoned that today wars are fought where there is no state-based threat to the UK. “These are wars of choice,” he said. He urged Gordon Brown to remove the royal prerogative when it comes to a decision about war. If Brown were to do this, such pressure brought to bear by Lord Garden would become a fitting legacy.